The new wave of Swedish Death Metal keeps on rolling and that might taint the picture of reviewed releases here in a little while, at least if the releases keep on coming in as lately and if they keep the quality! 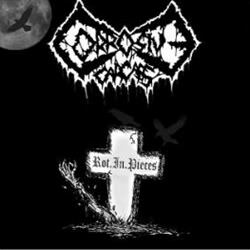 CORROSIVE CARCASS was formed in 2004, hailing from Storvik, a good deal North of Stockholm, and this is their first demo showcasing some grim and raw Death Metal. Grim and downtuned riffing is powering the beast and is kicking the music ahead, a good blend of buzzsaw riffing and a more melodic approach, the bass is present up front and it really suits the music and adds to the quite dirty almost punky atmosphere. The drumming is kicking it off with blastbeats and a good dose of cymbal blitzkrieg – the backbone delivers controlled chaos, again a fitting dimension to CORROSIVE CARCASS’ universe. The growled, at times puked vocals is again spot on in this raw universe. The tracks are a good mix of shifting paces, straight on madness and chaos and controlled pieces and guitardriven melodies – quite good work. On top of that a unique and disturbing atmosphere, that makes me think of old NECROPHAGIA and AUTOPSY. This is a pretty serious demo with some really good music on it, CORROSIVE CARCASS do have an attitude no other bands have right now, and on top of that they are delivering some stable and hardhitting Death Metal with a nice twist. Believe me when I say that we are going to hear a lot more from this band, unless they use 6 years on writing material for their next release that is!